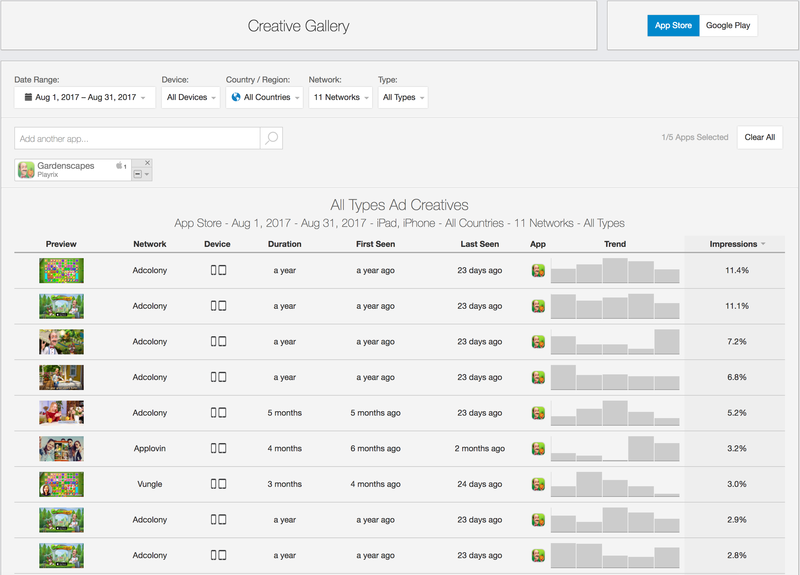 The Creative Gallery feature of Ad Intelligence provides a window into the creatives that other advertisers use as part of their current and past ad campaigns. You can search for a particular advertiser and get a high-level overview of its creatives over time, including the publishing network, the number of impressions and more. This feature provides insight on the most effective creatives from your competitors and allows you to utilize their mobile advertising strategies for your own campaigns. This tool also provides a detailed summary on specific creatives for the selected app, including a deeper dive into the ad networks that served them, the type of devices that received the ad, the resolution of the them, when they were first and most recently captured, and the history of impression volume. You can also download the creatives and save the video or image to your computer.